Spring Lake Regional Park in Santa Rosa. Hankering for a fun-filled day in the park with the family? Visit one of these parks and you’ll be carting home bushels of memories — the kind that last a lifetime. At 157-acre Ragle Ranch Regional Park you can experience an old-fashioned kind of picnic. Your kids will play soccer and volleyball in the sports areas, the whole gang will undertake relaxed strolls through meadows and woodlands, and built-in grills let you roast burgers and corn-on-the-cob to mouth-watering perfection. Ragle Ranch also offers a well-equipped children’s playground; dedicated sports areas for soccer, softball, sand volleyball, and tennis; a par course; individual picnic tables and a few reservable group picnic areas; a beautifully-landscaped peace garden for quiet contemplation; nearly four miles of trails; and a half-acre, leash-free dog park. Even though it’s easily accessible from Highway 101 near downtown Petaluma, at Helen Putnam Regional Park you’ll feel as if you’ve left the world far behind. The nine trails in the 216-acre park are relatively short, but can be combined to make a wonderful two- to three-mile hike offering beautiful panoramic views of steep rolling hills dotted with cattle and clusters of oak. One trail accommodates bicycling and horseback riding, and there’s also a children’s playground, a large fishing pond stocked with bluegill, a picnic area, and a gazebo. Dogs are allowed on a 6-foot leash. California’s founding took place on and around the beautiful central plaza in the town of Sonoma, which is where most of Sonoma State Historic Park’s attractions are located. 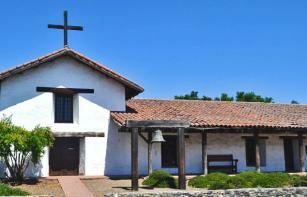 You’ll tour buildings important in California history, such as the last mission ever built (Mission San Francisco Solano in 1823); the two-story adobe barracks that once housed the Mexican army troops commanded by General Mariano Vallejo; or the Toscano Hotel, a 19th century wood-frame building furnished to look much as it did when it was a hotel in the early 1900s. A short walk from the plaza is Vallejo’s 1850s Gothic-style home and grounds, Lachryma Montis. You’ll also enjoy browsing the art galleries, clothing boutiques, wine tasting rooms, and restaurants that now inhabit the plaza’s historic buildings. At Petaluma Adobe State Historic Park, just a 15-minute drive from Sonoma Plaza, your family can explore genuine adobe ranch buildings from the mid-19th century (once the headquarters for General Vallejo’s agricultural empire). The rooms are filled with authentic period furniture and equipment. Cattle hides dry on racks, saddles stand ready on mounts, branding irons rest on a table. Lariats lay curled beside a powder horn, rope-soled shoes rest atop a sheepskin. Red-shouldered hawks fly overhead, and coyotes and foxes can be spotted in the grasslands. Located on Sonoma County’s far northern coast, Fort Ross was founded by Russian fur traders. From 1812 to 1841, Fort Ross was the hub of the southernmost Russian settlements along the west coast of North America — a commercial hunting/trading operation chartered by the tsarist government. Now a state park, reconstructed buildings recall the once-thriving colony, including the stockade, a Russian chapel, a barracks, two blockhouses, and a windmill. The only surviving original structure is Rotchev House, where the last manager of Fort Ross, Alexander Rotchev, lived beginning in 1836. The park museum offers details about the three main eras of Fort Ross: Kashaya Indian, Russian, and Spanish rancho. The 350 beautiful acres of Spring Lake Regional Park are home to a lake, ponds, oak woodlands, grasslands, meadows, and, for many months of the year, lots of wildflowers. It’s a popular place for hiking, boating, swimming, camping, and picnics. There's even an inflatable water playground in the swimming lagoon (Water Park admission is $10 per person or $45 for a family of four). For families, though, one of the park’s best features is the Environmental Discovery Center, with loads of interactive displays and activities aimed at kids 6-12: touchable sea creatures in tidal-action pools, an aquarium filled with fish from the park’s lake, taxidermied mountain lions and coyotes, and, in the storytelling cavern, learning tales about Mother Earth. “Science Saturdays” are held on the first Saturday of each month, with naturalists hosting fun science experiments. Naturalists also lead family hikes— in September and November through May—on the third Saturday of the month. The center is open to the public from noon to 5 p.m., Wednesdays through Sundays. Admission is free.